There are few things more that provide more personal satisfaction than watching something grow entirely thanks to the care that you provide it. This applies to all sorts of plants of course, but is particularly true when you get to enjoy the fruits (or veggies) of your labor, which is partly why food gardening in the U.S. recently reached its highest levels in over a decade. Yet, if you live in an urban city like Chicago, you might think gardening is out of your reach. After all, you have no yard, now solid earth of your own to use as a plot—where could you garden? Fortunately, there are already solutions that city folk in Chicago and other urban areas across the nation have been implementing to help bring gardening to your apartment: window and balcony gardening. There are even now landscapers specializing in designing balcony gardens. Windows and balconies offer ample space to raise vegetables, flowers, and herbs that will let you enjoy the relaxing activity of some light gardening, beautify your home, and possibly even give you something to eat. Here are some basic tips for starting up your own window or balcony garden. 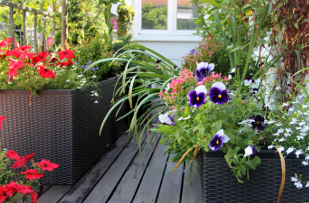 The first thing to think about when choosing your plants is the specific environment you will be placing them in. For example, if you live in an upper floor in a high-rise, the wind at those altitudes may kill most plants that you might want to grow. High winds also mean you need heavier pots to prevent them being blown over. If you have sufficient wind cover, the next thing to look at is the amount of sunlight your plants will get. Counting how many hours of sunlight the spot gets will help you narrow down what sort of plants are appropriate for your garden. In bright spots that get a lot of sunlight, vegetables and bright flowers can flourish, but balcony and window gardens with only partial sun or no sun are generally better for herbs as well as some varieties of flower. Of course, weather changes with the seasons, and with Chicago’s climate of extremes it may be wise to consider your balcony and window plants annuals, as overwintering them can prove too difficult. That said, this presents you with the opportunity to harvest what you’ve grown and select new plants for every season, keeping your window or balcony garden a dynamic part of your home. A big part of how well your garden does will have to do with where you position your plants. Plants with similar needs should share pots. This way, they can share the same space and more easily get the same environment they all need. It also makes it easier to care for and move them if need be. How high or low you place the plants is significant as well. In addition to placing pots on the balcony floor or in a window basket, you can use hanging pots, railings, and stands to create more variance in the levels of the plants. This will create a more full space with the feel of a real garden. However, you should give consideration to the heights of the plants, so that you don’t end up accidentally blocking part of your view once they grow a bit. Hopefully this has given you some ideas for starting your very own window or balcony garden. And maybe that green thumb of yours has even inspired you to adopt a greener lifestyle. 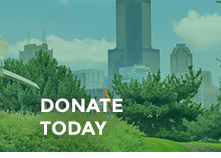 To learn more about other ways to bring nature into Chicago’s city life, or to get involved in greening efforts across the city, contact Chicago Gateway Green or give us a call at (312) 527-9621. Just as with your garden, so too with our city: tend it and keep it green, and your home will only be the more beautiful for it.